You are not looking for an ‘agent’ or a ‘Realtor’. You are looking for a result. 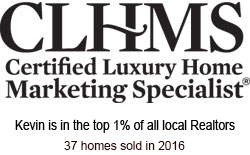 I am in the top 1% of local Realtors and while I know you don’t really care about that per se…please understand that I am statically more affective than 99% of the agents you could be considering. Put another way...I get results that most do not. When you review my marketing plan you will find that my resources are spectacular. From the use of a top designer to stage your home, a licensed home inspector, very high-end twilight and aerial photography...to my ability to market to other relevant agents; you will get an idea why my results are what they are. Although it’s natural to list a home with a friend or family member I can often provide different results. No matter how well meaning that individual is, he or she will not have my resources nor the competency one can only get from so many sales each year. There are so many opportunities throughout a sale to maximize and protect your interests, and the competency level of those in the top 1% is a big advantage. I fully understand some may read this and think I’m full of myself. Others will realize they are looking for a result and, measured in pure results, that is what I provide.